ACDID129384 ACDMA266 ACDCA67148 ACDSEP ACDSP ACDTY9 ACDGC PeSAMember. Vollrath Cayenne Bain Marie Food Warmer Counter Top Electric 120v - 71001. Low Price Guarantee On All Vollrath Products! This impressive Cayenne Counter Top Bain Marie Food Warmer by Vollrath is durable and innovative. It has a multitude of beneficial features. 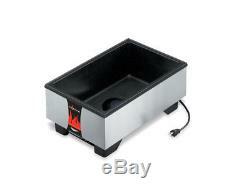 It's ideal for warming food at optimal temperatures. This warmers has direct contact heating. It meets the same performance criteria as much higher wattage units due to the direct contact with water and its heating elements. This unit will save you electricity costs. It uses over 40% less power than other warmers that are equal in size. It's a beneficial item to own. Dimensions: 13 3/4" (w) x 21 3/4" (d) x 9 (h). Electrical: 120v, 700 Watts, 6ft cord & plug, 5-15P. For maximum energy transfer, unit must be used with water. NSF, UL, Made in the U. The image above is for reference only. Other Related Items from ACityDiscount. See more items related to. This website is operated by ACityDiscount, a division of Peach Trader, Inc, a Georgia corporation. ACityDiscount strives to create a positive experience for all our customers and welcomes your suggestions. We value our reputation and hope you will give us the opportunity to proactively address any concerns you may have. ACityDiscount may update these Terms and Conditions at any time. We will revise the iteration date at the bottom of this page to reflect the most recent update. We encourage you to frequently check this page for any changes. You accept responsibility for checking applicable state and local codes and for ensuring items meet those codes before purchasing. You will not hold ACityDiscount responsible for anything not stated in the listing or included in the picture, including, but not limited to, assumptions made by you or any verbal statements. If you are ordering from outside the US or intend to pay with a card drawn on a foreign bank, please contact ACityDiscount. Warranties and Condition of Merchandise. While we stand behind the accuracy of our listing, there may be some small details that are not included in product descriptions; there is no guarantee regarding accuracy of information. Merchandise must be assembled, installed, and adjusted by knowledgeable, licensed, authorized and experienced personnel. There are NO WARRANTIES of merchantability or fitness for a particular use. Your cost to repair and recharge the system should be minimal. Regarding Used Equipment with Lighting Features: We do not certify or test the lighting features of used merchandise. Under 100lbs, Girth under 150. Please see the table below for more details. Schools, military bases, home businesses and churches are considered to be residential addresses. Failure to notate any defects could result in a significant reduction in the carrier's liability during damage claims. You are responsible for filing any loss or damage claims in the manner and time frame directed by the carrier. Any reports of malfunction may require a detailed inspection report from a qualified technician. You agree to cooperate with problem identification and correction efforts. You agree to abide by ACityDiscount's decisions regarding problem resolution. Our showroom located at 6286 Dawson Blvd, Norcross, Georgia 30093. If you give us notice, your order will be pulled to the warehouse loading dock and ready for loading when you arrive. Our warehouse staff will be happy to assist you loading your vehicle; however securing the load is your responsibility. ACityDiscount assumes no liability or responsibility for damages as a result of loads being improperly or inadequately secured. Items must be picked up as soon as possible. ACityDiscount accepts no liability for loss, theft, or damage to any item while stored in our warehouse. There was a problem caused by ACityDiscount, its suppliers or its vendors, such as the item being discontinued or being on back-order. The customer chooses to receive a store credit good for six months. Custom or manufactured-to-order items cannot be cancelled. Approval of return requests is at the sole discretion of ACityDiscount. This may be modified at the discretion of ACityDiscount. You must reach a return agreement with ACityDiscount and obtain a Return Authorization number prior to returning any items. There is no guarantee that a credit will be made for an unauthorized return. Repair or lost value charges for any damages incurred to product. Your account will be adjusted in the amount stated by ACityDiscount once all procedures have been followed. If you fail to follow these terms and conditions, there will be no credit. ACityDiscount's customer service and accounting staff will work hard to complete the process as quickly as possible. The item "Vollrath 71001 Cayenne Bain Marie Food Warmer Counter Top Electric 120v" is in sale since Friday, August 4, 2017. This item is in the category "Business & Industrial\Restaurant & Food Service\Commercial Kitchen Equipment\Storage & Handling Equipment\Heating & Holding Cabinets". The seller is "acitydiscount" and is located in Sheboygan, Wisconsin. This item can be shipped to United States.